This is the third sea day on the way to Myanmar (Burma). We saled the Bay of Bengal for two days and are now in the Andaman Sea. The Bay of Bengal is the largest bay in the world and it abounds with coral reefs, tropical dolphins and sharks. There was a recent finding of 6000 rare Irrawaddi dolphins here. We didn’t see any yet. Our sea days are very relaxing and we are now ready to leave tomorrow to tour Rangoon (Yangon) – this variety of names is very confusing sometimes – and then fly to Bagan for an overnight sightseeing trip of the many temples there. There are about 91 people going on that excursion. We got a notice that the internet will be erratic due to some types of interference in this area and for sure that has been true. It cuts out all the time when you are lucky enough to get on. So I hope to get this posted! We were warned that there is a big surcharge to use credit cards here and that dollars are accepted. Also that Yangon has very heavy traffic – “traffic laws are routinely ignored and driving can be hazardous” so renting a car is not recommended. As if we would even THINK of doing that! Today we have a special trivia session for ATW (that means Around the World) travelers and we will get our special shirts that say Around the World in 180 days. I will take a picture for the next blog. I am continuing with the bridge lessons but I am sad to say that Norm has quit again. He says it is too much work for a vacation. But I have met many fun people to play with on board, although some are only on for segments of the trip and then I meet new ones. The artist in residence from the first segment, Pat Grillo, is back on. We had dinner with she and Angelo a couple of nights ago – fun! And we met someone who was originally from Shippensburg. Small world for sure. I am continuing doing some art classes, and right now there is a lecturer on board, John Freedman, who is doing lectures on Buddhism and the temples of Myanmar. He is also doing one on the seven wonders of the world. He is a retired physician and very knowledgeable, enjoying him. We have had a couple of great shows in a row, too. Ashley Carruthers, who is in the Guiness Book of Records as the world’s fastest pianist. He is amazing. The other group is called the Boys in the Band and they are doing everything from Jersey Boys to Queen. Both are Australian. It’s fun on a small ship because you get to meet them around the ship and get to know them a bit. Generally each performer or group stays on and does two different shows a day or two apart. Last evening we had dinner with a couple from Australia that we dined with before and had fun deciding where we will go when we return to Australia on another trip. And in the vein of small world, we also met two sisters who were on the Nautica with us when we traveled on the wine trip in 2008 – we didn’t meet them then, but they were saying that they were wishing they were part of the wine group. 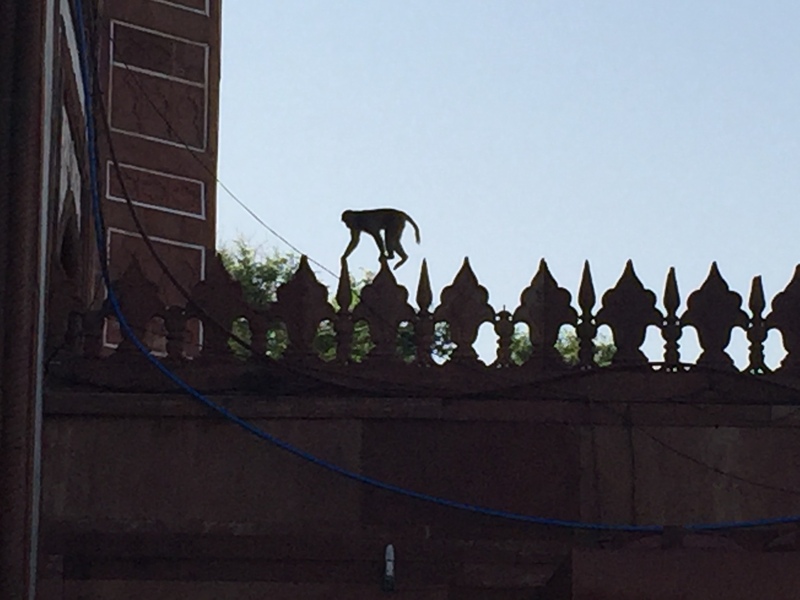 Did I mention the many monkeys around the Taj Mahal? They are climbing on the walls, etc. One of our favorite waiters, Than, is from Myanmar and he will leave for his vacation when we reach there. He is SO excited to see his family including his two daughters, 3 and 5 years old. He was beaming when he served us last night. We are still on that strange 30 min time adjustment and that will change before we reach Thailand, after Myanmar. So now we are 10 1/2 hours ahead of our time at home in Philadelphia. We did weigh ourselves this morning and Norm is just slightly up and I am maintaining the loss. Pretty good at almost the half way point of the trip! We are watching the hurricane at home and now it looks like it will veer to the northwest and miss the NJ shore. We hope so! Anyway, on to Burma (Myanmar) and lots of adventures to come. This entry was posted in At Sea, October, World Cruise 1. Bookmark the permalink.